PDP-7 Serial number 47, On display in the DEC Sydney Chatswood office, dated around 1981. On display in the DEC Sydney office, dated around 1989. S#47 features in a history display from around 2005. In a poster produced by the NOP (nostalgic, obsolete products) SIG of the DECUS user group, with its descendant - a UNIX work station. A front view of #47 whilst in manufacture. A rear view of #47 in manufacture. 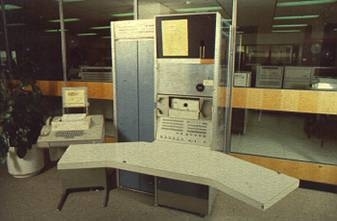 At some time in its life the PDP-7 at Lucas Heights was hooked up to a Digital Equipment PDP-15 with an inter-computer data link (data). Designed and used by the Australian Atomic Energy Commission at Lucas Heights, this hybrid of a PDP-7 and PDP-15 was called a PDP-22, however this was not an official DEC designation. It seems that several PDP-7's were connected to other computers, indeed we know of and were actually involved in the diagnostics of another PDP-7 link, this time to a PDP-11. This was at the National Gas Turbine Establishment (Pyestock) in the UK. "Grandpa" retires after 15 years. "The oldest working computer being used for scientific research at the Australian Atomic Energy Commission has been formerly handed back to Digital Equipment Australia PTY Ltd. Dr. J.R. Bird presented the Digital Equipment PDP-7 to Max Burnet, the company's general manager." 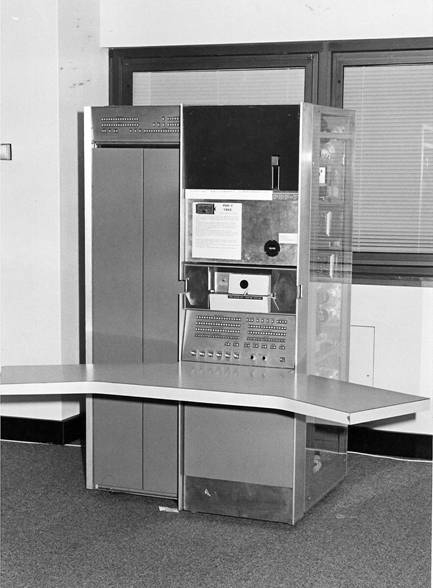 "Bird, the leader of the nuclear applications and energies studies section, noted that in 1966 its newly installed Digital Equipment PDP-7 was unique in Australia. Its main role was in association with the measurement of new scientific data. Within a year of its arrival, a young student was exploring the possible application of nuclear reactions for the study of oxidisation processes." 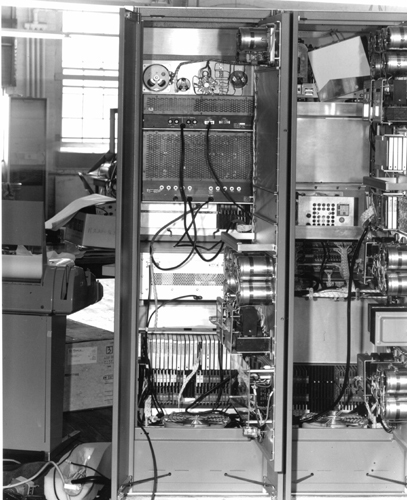 "By 1968, the PDP-7 was operating the world's first proton microbeam facility for computer-controlled positioning of neutron counters. This pattern of science and application has continued with increasing diversification up to the present day." "After 15 years and 111,577 hours of operation "Grandpa 7" was ready to retire. The Digital Equipment PDP-7 will be housed in the Computer Museum at Digital Equipment's headquarters in Chatswood. It will complement the present exhibits which include an old PDP-5 from BHP and a PDP-6 from Western Australia." "Burnet thanked the commission for the opportunity for his museum to acquire the only remaining PDP-7 in Australia. He enthused about the "hand wrapped cables and the soldered joints". "In return for the PDP-7 he presented Dr. Richardson, chief of applied mathematics and computing division with a Digital Equipment LSI-11/23. An additional LSI11/23, which will take over from the earlier system, will have 32 times the direct memory capability of the original PDP-7 and an intelligent front end terminal which will handle all the interaction with user and equipment." Twenty one years of UNIX software is represented here between the PDP-7 of 1964 and the VAXstation 2000 of 1988. 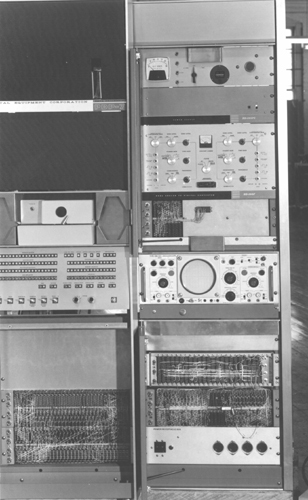 The PDP-7 was the original computer that Ritchie and Thompson wrote the first UNIX operating system on at Bell Labs in 1967. 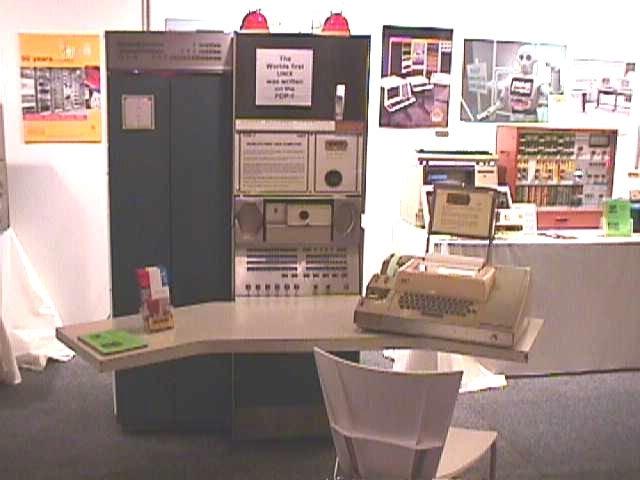 The PDP-7 in the poster was the third DEC computer to enter Australia. It was installed at the Atomic Energy Commission, Lucas Heights, on the 27th Jan 1966 and ran for 14 years, clocking up 111,577 hours or 12¾ years continuous. The PDP-7 was an 18-bit machine and was notable for the solidity of its construction - weighing just over half a ton! The VAXstation is shown running 12 Ultrix windows simultaneously. The VAXstation had 500 times the memory of the PDP-7. This poster was produced by the NOP (nostalgic, obsolete products) SIG of the DECUS user group. 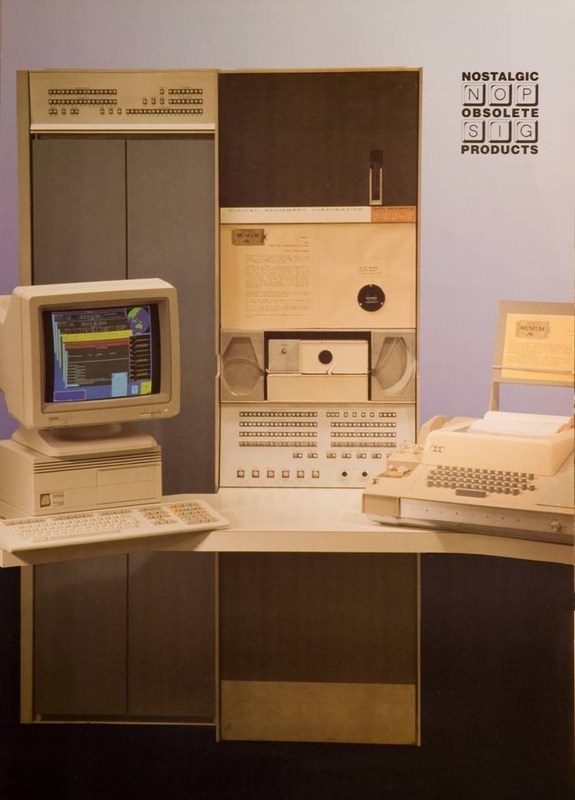 The PDP-7 is now in the BACK museum collection." 444B 000051 000000 Pulse Height Analysis? 460Kb pdf Description, commands and hardware drawings of a PDP-7 to PDP-15 inter-computer data link. Designed and used by the Australian Atomic Energy Commission at Lucas Heights, this hybrid of a PDP-7 and PDP-15 was called a PDP-22, but this was not an official DEC designation. ISBN 06-4299-523-0, document in the public domain, copyright of this document resides with the Australian Atomic Energy Commission. #113, at the University of Oregon. - 65,000 hours of use (or 7½ years continuous) logged after nearly 40 years. Delivered in February 1966 and scheduled for removal at the end of 2001, #113 would appear to have lingered on at the University for another five years until finally being moved in June 2006, it was still in a running condition. This machine is now at Paul Allen's Living Computer Museum (PDPplanet Project) in Seattle. It has been restored and is now fully operational and open to public viewing at the museum.